iROBOT, ILIFE, NEATO and ECOVACS are four of the most important vacuuming robot manufacturing companies today, and all four companies make a number of robot models offering various features ranging from the most basic to the most sophisticated. iROBOT's Roomba 980, ILIFE's A8, NEATO's Botvac D7 Connected and ECOVACS' Deebot Ozmo 930 represent advanced level vacuuming robots each of these four company makes. So, if you are asking "Which robot vacuum is best? ", you might find this article useful. We will compare here these four robots, so you can choose the one that will best respond to your home's vacuuming needs. Note that these four robots belong to an exclusive groupe of auto-resume vacuuming robots available today that can resume by themselves the vacuuming job exactly where it gets interrupted when the robot returns to its docking station to recharge. This means that these robots are able to clean very large areas with almost no human intervention, unless the space to be cleaned is so large that the dustbin needs to be emptied (note however that, for most homes, the dustbins that these robots are equipped with are large enough to handle a complete cleaning cycle without having to empty it more than once). However, the four robots considered here are by no means identical in terms of the features they offer. If you are considering getting one of these four robots, but you are not quite sure which to get, you have come to the right place. 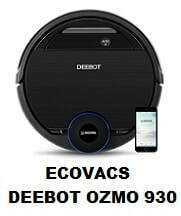 iROBOT Roomba 980, ILIFE A8, NEATO Botvac D7 Connected and ECOVACS Deebot Ozmo 930 vacuuming robots. 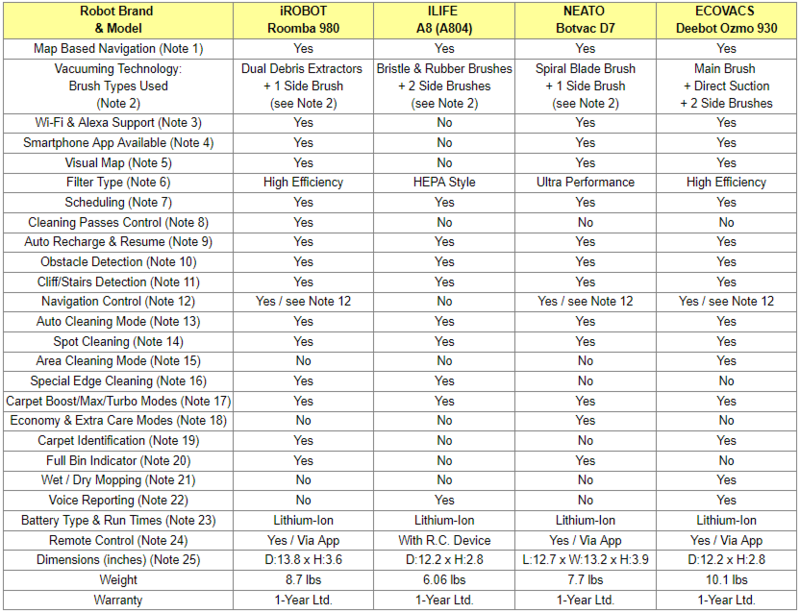 Otherwise, please read on below for a detailed comparison of the four robots. The iAdapt 2.0 responsive cleaning technology used by Roomba 980 is composed of sophisticated software and sensors that allows the robot to clean thoroughly the room, making multiple passes, avoiding stairs and obstacles, getting under and around furniture, and cleaning along wall edges and corners. All four robots considered here can be used effectively on both bare floors (tile, hard wood, laminate) and low pile carpets. ILIFE A8 comes both with a bristle brush and a rubber brush that can be interchangeably used. Though both type of brushes can be used on all type of floors, the bristle brush is best for carpets, while the rubber brush is best for hard floors and pet hair. 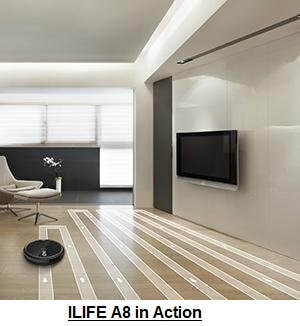 ILIFE A8 is also equipped with two side brushes that effectively gather dirt and debris at corners and edges. Neato's SpinFlow technology used in Botvac D7 Connected combines powerful vacuum suction and precision brushes to leave floors immaculately clean. The robot can be equipped with two types of brushes: a spiral blade brush which combined with Neato's powerful vacuum suction removes easily debris, dirt and fibers, and a side brush for thorough edge cleaning which allows the robot to get deep into corners and right up against walls as well as base boards for superior cleaning coverage. ​The robot is equipped with double side brushes for cleaning along wall edges. With Roomba 980, Botvac D7 Connected and Deebot Ozmo 930, when these robot are connected via Wi-Fi to your smartphone, you can use their associated free App to invoke remotely from wherever you may be the various operations available, such as scheduling and operating the robot, viewing the status of cleaning jobs, and customizing your cleaning preferences. Note that Roomba 980, Botvac D7 Connected and Deebot Ozmo 930 are also compatible with Amazon Alexa, so they can be controlled with vocal commands. Simply ask Alexa to start, stop, or dock your robot​. With Roomba 980, Botvac D7 Connected and Deebot Ozmo 930, you can download their associated free App to control your robot remotely using your smartphone from wherever you may be, as long as your robot is connected to your home's Wi-Fi, and your smartphone has access to internet. Using the App associated with Roomba 980 and Botvac D7 Connected, you can generate a visual map of the space vacuumed that shows where your robot cleaned, along with details such as floor coverage summaries. With Botvac D7 Connected, you can also use the map to create Virtual Boundaries in the space to be cleaned to prevent the robot from entering rooms and areas that are not supposed to be cleaned (see Note 12). Deebot Ozmo 930 generates a visual map that can be used to assign cleaning tasks to the robot, monitor the actual position of the robot, check the floor coverage and cleaning status, and much more. To see the visual map, you need to use the associated App on your smartphone or tablet. Roomba 980 is equipped with an AeroForce High Efficiency filter that can capture 99% of allergens, pollen, and particles as small as 10 micron. 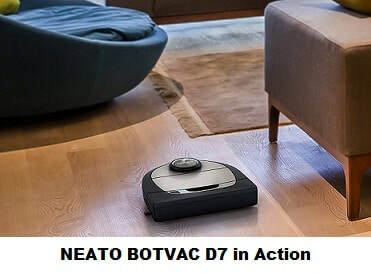 The Ultra Performance filter found on the Neato Botvac D7 Connected robot can capture dust, pollen and other particles as small as 0.3 microns, and therefore, it can be considered as a HEPA sytle filter. The filter used by Deebot Ozmo 930 is also a high-efficiency two-part air filtration system that does an excellent job at filtering out pollen, mold spores, dander and more​. The filters that come with all four robots of filters are easy to remove and clean. 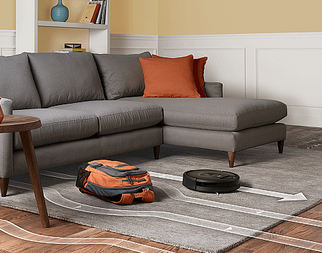 All four robots allow you to schedule the vacuuming at specific times every day of the week. You will need to use the robot's associated Android or iOS App for scheduling. Most vacuuming robots will remove dirt and debris with just one pass over each area of your home, but with Roomba 980, two-pass cleaning can be requested and can be particularly helpful in homes with pets or simply for periodic deep cleaning. The number of cleaning passes is one by default. When batteries run low, all four robots considered here return to their docking station and recharge. ​Note that, most vacuuming robots need to be restarted after they recharge themselves at their docking station (unless of course they had been previously scheduled to restart at a later time). But all four robots considered here are able to resume automatically the cleaning job where it was interrupted before going to their docking station to recharge. They continue this way until the job is done and the entire level of your home is cleaned! Alll four robots considered here are equipped with sensors that detect obstacles and try to avoid them to protect your furniture. All four robots considered here are equipped with sensors that detect stairs. When they detect stairs, they slow down and select a new path. To prevent the robot from entering off-limit areas, Roomba robots can be used with Virtual Walls which are tiny devices that emit an infra-red beam that the robot will not cross. Roomba 980 does not use any Virtual Walls, but uses Dual Mode Virtual Wall Barriers which, like Virtual Walls, can be used to block off an open doorway, but they can also be used as Virtual Wall Halos which protect some restricted area within the room that may contain things like pet bowls or pile of toys. These units require 2 AA batteries. Roomba 980 robot comes with 2 Dual Mode Virtual Wall Barriers, batteries included. With Botvac D7 Connected, to prevent the robot from entering certain rooms or certain areas that are not supposed to be cleaned, you can create Virtual Boundaries using the smartphone App and the visual map of the space to be cleaned. These boundaries are called No-Go Lines. Note that, with all Neato Botvac robots, including Botvac D7 Connected, to prevent the robot from entering certain rooms, one can also use Boundary Markers made of magnetic strips that are laid along the entry to off-limit areas. They are simple to use and best of all, they don't require any batteries (Boundary Markers can be purchased below in the Amazon products section). With Deebot Ozmo 930, to prevent the robot from entering certain rooms or areas, virtual boundaries can be set using the App and the visual map. This is done very simply by pressing the appropriate button indicated on the App's map screen. When automatic cleaning is invoked, all four robots considered here will use the navigation and vacuuming methodes described above (in Notes 1 & 2) to automatically perform the vacuuiming job, intelligently covering and effectively cleaning the targeted space. Auto cleaning can be invoked by pressing the appropriate button on the robots. For Roomba 980, Botvac D7 Connected and Deebot Ozmo 930, it can also be invoked from your smartphone via the associated iOS or Android App. For ILIFE A8, it can also be invoked using the remote-control device. All four robots considered here can be asked to spot clean. This will make the robot to focus ​on a specific area for an intense and localized cleaning. 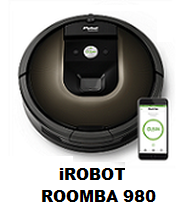 For Roomba 980, spot cleaning can be invoked either by pressing the spot clean button on the robot itself, or from your smartphone via the associated iOS or Android App. For For ILIFE A8, it can be invoked using the remote-control device. 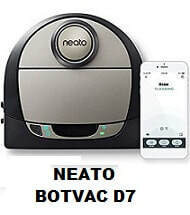 For Botvac D7 Connected and Deebot Ozmo 930, spot clean can be invoked from your smartphone via the associated iOS or Android App. After Deebot Ozmo 930 has scanned and mapped the environment, specific areas on the visual map that it creates can be selected for area-based cleaning prioritization using Area Cleaning Mode. Area Cleaning Mode can only be selected using the App​. 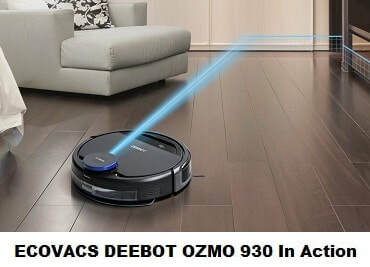 Though Botvac D7 Connected and Deebot Ozmo 930 do not have a special edge mode that can be invoked, they are equiped with side brushes that clean wall edges and corners during the regular auto clean mode. The Turbo mode is the default mode in which Botvac D7 Connected runs. In this mode, the robot brush and blower are set to high, providing strong suction and moving at a normal speed. Eco mode which is the power saving economy mode and gives you a quiet, longer cleaning.​ In this mode, the brush and blower are at a medium setting, allowing the robot to clean a larger area on a single charge. This is the quietest mode. Extra Care mode is useful if you have delicate furniture or areas your robot has trouble navigating. With Extra Care enabled, the robot navigates more carefully around objects and obstacles. Roomba 980 is able to detect that it is cleaning a carpet, and it will then boost the vaccuming power to provide a deeper clean. ​Deebot Ozmo 930 can mop and vacuum at the same time, but it uses ECOVACS’ Adaptive Floor Sensing (AFS) technology to detect the floor type, so it knows when to mop and when just vacuum. So, Deebot Ozmo 930 will avoid carpets when the mop pad is attached without any intervention from you. And when the robot is on carpet, AFS will increase suction power automatically for a deeper cleaning. Though ILIFE A8 and Deebot Ozmo 930 do not have a full bin indicator, for the average size home, their bin is large enough to handle a complete cleaning cycle without having to empty it more than once. Deebot Ozmo 930 has an optional mopping system that uses a wet/dry cleaning cloth attached to a reservoir. Once the cloth is attached and the mopping mode is selected, the Advanced Wet/Dry Mopping System dampens the cloth pad from liquid from the reservoir, mops the floor and dries it to a sparkling shine! ​An electronically-controlled water pump consistently draws water from a large reservoir to initiate the mopping. In addition, the robot has sensors that allow the robot, depending on the floor being bare or carpeted, to automatically switch to mopping mode or stop dampening the cloth, so as to guarantee a safe and deep clean. 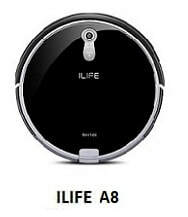 ILIFE A8 and Deebot Ozmo 930 are equipped with intelligent voice technology that tells you vocally what the robot is doing or if it requires attention. If these robots have something to report (such as errors, problems or status information), they will announce it vocally in real-time..
All four robots considered here are equipped with a high capacity rechargeable Lithium-Ion battery battery. Note that Lithium-Ion batteries are designed to provide longer cleaning sessions than other battery types such as Nickel Metal Hydride (Ni-MH), and they last longer before needing to be replaced. ​Botvac D7 Connected: 120 minutes. Roomba 980, Botvac D7 Connected and Deebot Ozmo 930 can be remotely controlled from your smartphone or tablet using the associated free App to schedule the robot, to invoke the various run modes, to send the robot to the docking station, etc. No explicit remote-control device is provided. ​​Note that Roomba 980, ILIFE A8 and Deebot Ozmo 930 are circular robots, while Botvac D7 Connected is D-shaped. For the circular robots, "D" in the dimensions refers to the diameter, and "H" to the height (or thickness) of the unit. For the D-shaped robot, "L" refers to the length, "W" to the width and "H" to the height (or thickness) of the unit. ​All measurements are in inches. ​​So which of these four vacuuming robots is best for your home? Having read the above comparison, you should be in a better position to answer the question "Which robot vacuum is best?". As the comparison table shows, the four robots considered here are quite similar with respect to some of the basic must-have features such as mapping out the space to be vacuumed to ensure complete coverage, avoiding stairs and obstacles, scheduling, efficient filtering, auto recharging and resuming the job where it was interrupted after an auto-recharge. However, the four robots are by no means identical, and each offers a number of exclusive features. Therefore, we suggest you carefully study the above table and clarification notes before you decide which robot will best respond to your home's cleaning needs. It features the powerful ILIFE Gen 3 CyclonePower suction system. It features the SpinFlow technology which combines powerful vacuum suction and a precision spiral blade brush that leave floors immaculately clean removing easily debris, dirt and fibers. It is D-shaped rather than circular, which means that it can be very effective cleaning wall edges and corners. To prevent the robot from entering certain rooms or certain areas that are not supposed to be cleaned, it features Virtual Boundary creation. There is no need for battery run small devices like in the case of Roomba 980. It features the default powerful Turbo running mode. In this mode, the robot brush and blower are set to high, providing strong suction and moving at a normal speed. It features interchangeable suction options: You can either choose the main brush option for deep cleaning, or easily switch to the direct suction option for vacuuming up human and pet hairs without tangling. It is equipped with double side brushes for cleaning along wall edges. To prevent the robot from entering certain rooms or certain areas that are not supposed to be cleaned, it features Virtual Boundary creation using the App. There is no need for battery run small devices like in the case of Roomba 980. It features a mopping system that uses a wet/dry cleaning cloth attached to a reservoir. Once the cloth is attached and the wet mopping mode is selected, the Advanced Wet/Dry Mopping System dampens the cloth pad from liquid from the reservoir, mops the floor and dries it to a sparkling shine!